–Charles Hayward appeared in Saratoga last week to discuss various elements of the upcoming racing season. In what will be welcome news to many, there will be nine races on weekdays this year, “in response to criticism about weekday programs being too long.” Hallelujah—I’m about as passionate about Saratoga racing as anyone, but ten races a day, most days, is just too much. –In a separate Saratogian article last Friday, Post reported on NYRA’s plans for the future at Saratoga—a future in which it is assumed that VLT’s will be installed at a NYRA track to fund improvements. Among the ideas under consideration: a two-story restaurant next to the clubhouse; backstretch worker housing; and infrastructure work on the main building. –Is there anyone who hasn’t read about the moose who made an early appearance at the races last week? 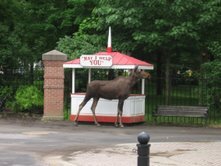 A newspaper in Minnesota, NBC Sports, and a radio station in Washington, D.C., in addition to the usual racing media suspects (Saratoga area newspapers, trade publications) all picked up the Associated Press account of the moose’s visit, often with the now virtually iconic photo of the moose standing in front of a customer service kiosk. –Of course, the big news is that Rachel Alexandra arrives at Belmont today, in advance of her appearance in the Mother Goose this Saturday. In honor of her owners’ donation to breast cancer research, pink bracelets with the filly’s name will be given out on Saturday, and all women will get in free. A similar campaign was launched when Rags to Riches was due to race at Belmont in the summer of 2007; unfortunately, she scratched, but we still got in free and got our Rags buttons. In response to several queries I received about the meaning behind the Rachel Alexandra slogan—“Is She the One?”—I was told that it referred to the filly who would do what no other filly has. Winning the Preakness and the Travers would certainly qualify. –Finally: it’s not all that unusual for a riderless horse to cross the wire ahead of her competitors, but something about Phone Jazz’s Saturday romp at Belmont has earned the three-year-old filly her fifteen minutes of fame. She charmed Dana Byerly of Green but Game; ESPN posted video from the race; and Phone Jazz earned her own albeit brief segment on Monday’s Pardon The Interruption. ESPN didn’t manage to pronounce jockey Jean-Luc Samyn’s name correctly in either segment, and one imagines that trainer Michael Sedlacek hopes that his filly can repeat the performance with her jockey next time. In some Backstretch housekeeping: some time ago, the address for this site was changed from http://www.brooklynbackstretch.blogspot.com to http://www.brooklynbackstretch.com, with the former automatically re-directing to the latter. That no longer seems to be happening, particularly for users of Internet Explorer. So if you haven’t updated your bookmarks, please do (though my guess is that if your bookmarks aren’t already updated, you’re not reading this!). Ahh, the name change explains why I couldn't find you over the weekend. Today I was redirected with no problem.Speaking of Rachel, they are selling t-shirts over at horsehats.com:"Rachel Alexandra Runs Like a Girl"Also saw a riderless filly cross the wire first when we were at Churchill in April. Stealing Kisses is her name. She got a big standing O when they brought her back around. It was very cool to watch how she cut through traffic to get onto the rail and then just cruised on home.